As Steve Leinwand noted in his Thursday talk, math teachers are a relatively conservative, risk-averse bunch. Perhaps our conservatism comes from the perceived slow but steady progress of math over millennia where it's easy to take comfort in the old because the new can seem so difficult to obtain. Some of this rubs off in the way we teach, the activities we choose for students, and our judgement about what's important for students to know. Chris Danielson's session kicked off by calling out some mathematics that gets taught in the name of "needing it for calculus," despite no widespread need for it anymore. Simplifying radicals. Rationalizing the denominator. Simplifying rational expressions. Factoring quadratics. Composition of functions. The binomial theorem. It's not that someone, somewhere doesn't have a use for these things, but what is increasingly becoming the exception should not prove the curriculum rule. Mediocre proficiency with these topics is not what leads students to be successful in calculus. What students really need for calculus is a deep understanding of slope as a rate of change and accumulation. This is a familiar story for some of us. We cringe when we ask students "What's slope?" and they parrot back, "rise over run" without knowing much beyond that. Yes, that might be one way to describe slope, but there are other, and arguably more important ways to describe slope. Danielson's focus on slope as a rate of change not only is most fundamental for calculus, but it is in alignment with the research on teaching slope (Lobato & Thanheiser, 2002; Peck & Matassa, 2012; Stump, 1999, 2001). Danielson led the well-attended workshop through a number of middle-school appropriate tasks involving rates of change. Because the tasks were set in informal contexts, students would be most likely to work in terms of "dollars per bicycle rental" or "enjoyment per piece of candy," depending on the context of the problem. Time was spent not just looking at rates, but doing simple calculations to compare changes in rates over time, a fundamental conception needed for calculus. The problems in the workshop were adapted from tasks found in Connected Mathematics, a popular NSF-funded curriculum for the middle grades. 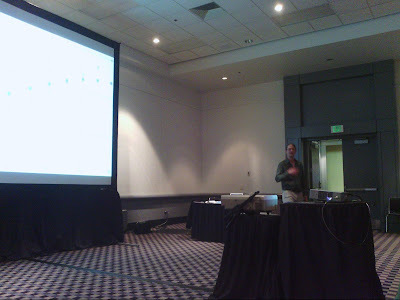 For Christopher's presentation, related tweets, and participant notes, see his post at http://christopherdanielson.wordpress.com/2013/04/21/the-goods-nctmdenver/. Lobato, J., & Thanheiser, E. (2002). Developing understanding of ratio-as-measure as a foundation for slope. In B. H. Litwiller (Ed. ), Making sense of fractions, ratios, and proportions (pp. 162–175). Reston, VA: NCTM.